Please scroll below to find the perfect ninja class for you! For shoes, we recommend having low tread rubber soles. If you can fit into an adult size we recommend the New Balance Zante. 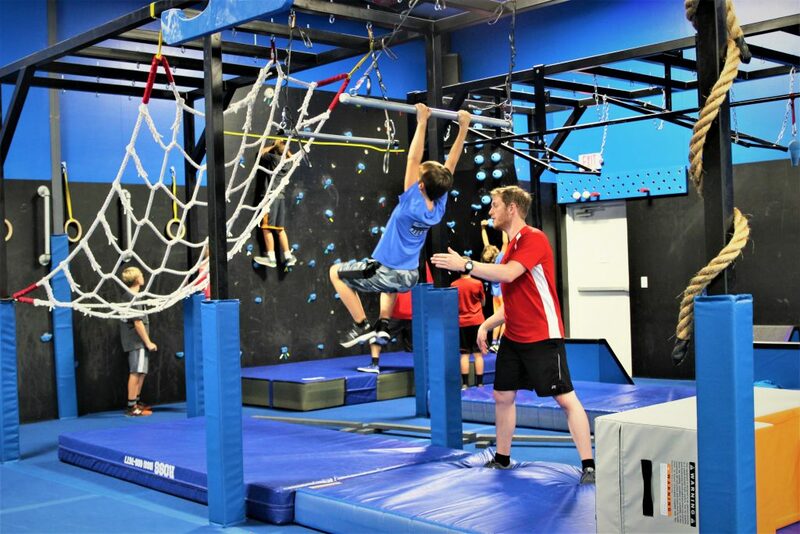 We're offering a full Ninja Warrior experience during our Spring Break Camp! Your ninjas will spend 3 hours a day for 4 days working closely with our coaches to hone in on their Ninja skills. 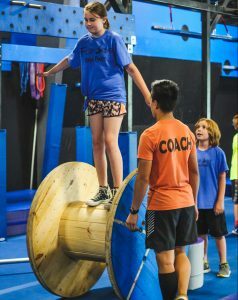 They'll start each day with active stretching and conditioning, move into specific obstacle training, run obstacle courses with the lights and sounds of their favorite TV show (including the buzzer on top of the warped wall! ), and play awesome Ninja games that will keep them moving and having ridiculous amounts of FUN! Our ninjas are bound to leave exhausted but itching to return the next day! 5 to 8 years old click here to sign up! 9 to 13 years old click here to sign up! Are you ready to be a Flip Side Ninja?! This 15-week class is designed to take our youngest ninjas from beginners to obstacle masters! To become a true Flip Side Ninja, our junior ninjas must complete our stages (just like the tv show!). 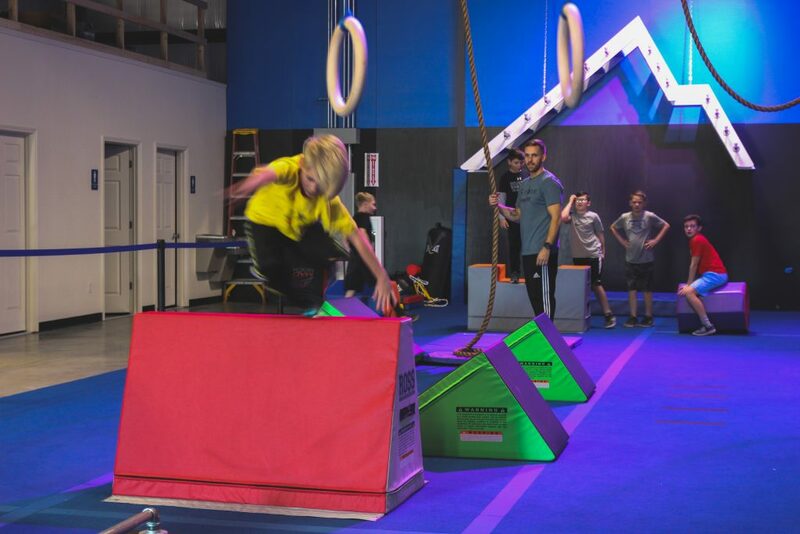 Our instructors will guide each ninja through various exercises, basic parkour/freerunning techniques, and obstacles to lay a strong foundation of skills to build on week by week. Every few weeks the ninjas will be tested on stage challenges and awarded for completion. The 15-week session includes 1 instructed class per week. Every ninja will receive a FSNP T-shirt. Each Ninja will be awarded a new FSNP wristband for completing stages 1-3 (tested weeks 4, 8, and 12). This class is designed as a fun and challenging ninja class that can be repeated for multiple semesters. Multiple semesters may be required to build the strength and coordination for our competitive classes. Looking for more of a challenge and are interested in competing? For those who breeze through our Flip Side Ninjas semester we have competitive classes available. These classes require an athletic mindset (focus and listening skills) and are more physically demanding than our FS semester. There are specific tryouts for these classes. Multiple Flip Side Ninjas semesters may be required to build the strength, mindset, and coordination for our competitive classes. Please see the front desk for more details. As everyone knows, the weather can be crazy here! If we are unable to open the gym due to weather, the class skills and obstacles that were missed will be integrated into the following week class period. If the gym is able to open and you are unable to safely make it in, we will do our best to fit the student into a similar age group class during the same week. Please stay tuned to our Facebook page for up to the minute information on any closures. We will offer a FULL REFUND to all new ninjas who decide within the first two weeks that this class is not for them. Beyond that, this class is a 15-week commitment as we cannot add new students later in the semester since the curriculum progresses with each class. Please reserve a spot early! Our Advanced Flip Side Ninjas class is for our ninjas that have completed all 3 stages of our our Flip Side Ninja program and still want a challenge! This class is designed to continue to safely push our ninjas to their limits, and beyond! They will train on several of the top level obstacles not taught during the Flip Side Ninjas semester due to their difficulty level. Any ninja interested must have good upper body strength that we can build on throughout the class. The ninjas will be able to train to complete our ultimate goal of reaching stage 4 and will be awarded a special t-shirt! 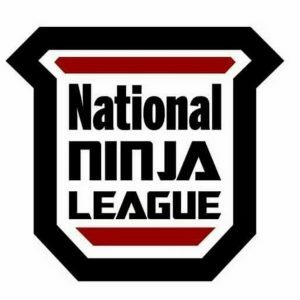 The Flip Side Ninja Team will select the best of the best of our Junior Ninjas to be on our competitive team where we'll travel to nearby ninja competitions held by the National Ninja League or Ultimate Ninja Athlete Association. The Ninja Team classes will be a mix of adult team members and junior team members designed to push our ninja's skill levels to the edge for the maximum competitive edge. Each ninja will receive a Flip Side Ninja competition team t-shirt with their registration. Need a little extra help with your lachè or struggling with the slackline? We've got you covered! We now offer private lessons on an appointment only basis on Mondays at 7pm and 7:30pm, and Wednesdays at 6pm and 6:30pm. The first 5 minutes of your first session will be a consultation with the coach to set goals and objectives for the lessons. Please let us know if you have any other questions!